Bronntar orainn an Brat Gníomhach inniu. Maith sibh gach duine! Tá uair an chloig Corpoideachais ag gach rang gach seachtain de réir an churaclaim. I rith na bliana clúdaítear na 5 shnáithe den churaclam; lúthchleasaíocht, oiliúint uisce, damhsa, gleacaíocht, cluichí agus gníomhaíochtaí lasmuigh agus gníomhaíochtaí eachtraíochta. Bíonn ceachtanna snámha ag Rang a 3, 4 agus 5. Spreagtar páistí de gach ábaltacht páirt a ghlacadh i ngach ceacht corpoideachais agus chuaigh múinteoirí faoi oiliúint chuí le freastail ar gach riachtanas sa scoil. Bíonn iniúchadh fearais spóirt ag an gcoiste gníomhach gach téarma agus eagraíonn siad an stóras spóirt i rith na bliana chomh maith. Each class has 1 hour of timetabled Physical Education per week as per curriculum guidelines. Throughout the year, 5 strands of the curriculum are covered by all classes; athletics, aquatics, dance, gymnastics, games and outdoor and adventure. Practical swimming lessons as part of the aquatics strand is covered in 3rd, 4th, and 5th class. Children of all abilities are encouraged to take part in PE lessons and staff members have had specialised training to cater for all needs. Our coiste gníomhach carries out an audit of our sports equipment on a termly basis and also maintain the organisation of the store as needed. Tá cúpla tionscnamh ar siúl i nGaelscoil Ros Eo chun gníomhaíochtaí fisiceacha a chuir chun cinn sa scoil agus taobh amuigh d’am scoile, ionas go mbeidh na daltaí in ann an sprioc de 60 nóiméad de ghníomhaíochtaí a dhéanamh gach lá. Tá dhá am sosa ag na ranganna ina bhfuil cead súgradh ar an gclós. Mar gheall gur mana ár mBrat Gníomhach ‘Úsáidigí bhur gcosa ag am sosa’ ba chóir go mbeadh na páistí ag rith! Ar an gCéadaoin agus Aoine is féidir leo fearas spóirt a úsáid ar an gclós. Chomh maith le sin tá ‘Cluiche na Míosa’ agus ‘Dúshlán na Míosa’ le déanamh ag na daltaí freisin ar an gclós. Ar laethanta fliucha, bíonn ar na ranganna fanacht sna seomraí ranga ach bíonn deis acu gníomhaíochtaí fisiceacha a dhéanamh sa rang. 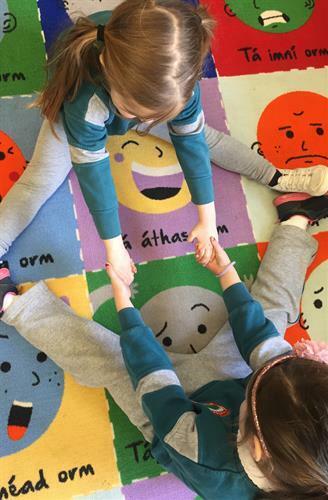 Tá sosanna gníomhacha i rith an lae daingnithe i gcultúr na scoile. Achan Aoine, i rith na míonna is fuaire, téann an scoil iomlán chuig an halla fá choinne 10@10 treoraithe an an gcoiste gníomhach. Sna míonna níos teo siúlann muid timpeall na páirce faoi thrí. Bain triail as 10@10 sa bhaile! Tugtar obair bhaile Super Troopers do gach rang gach lá chun béim a chur arís ar 60 nóiméad de ghníomhaíochtaí fisiceacha a dhéanamh sa lá. Déanann na múinteoirí seiceáil air seo gach Aoine agus bíonn deis ag an rang 15 nóiméad sa bhreis am spóirt a fháil má bhíonn an obair seo curtha i gcrích. Gaelscoil Ros Eo has a number of initiatives in place to encourage physical activity in school and after school in order for our pupils to achieve the goal of 60 minutes of activity a day. The classes have two scheduled break times in which they have time to play on the yard. As our active flag slogan is ‘Úsáidigí bhur gcosa ag am sosa’ (Keep moving at lunchtime) running is encouraged! On Wednesday and Friday the children can use sports equipment at lunchtime too. We also have a ‘Game of the Month’ and a ‘Challenge of the Month’ for pupils to complete. On wet days, the classes have supervised lunch indoors but will complete some physical activity in the classroom. This is embedded in the school’s culture of providing physical brain breaks throughout the day as well. Every Friday, during the colder months, the whole school gathers together in the halla to complete Operation Transformation style 10@10 exercises lead by the coiste gníomhach. In the warmer weather we complete 3 laps of the football pitches. Super Troopers PE homework is given every night to each class to further encourage the goal of 60 minutes of activity every day. This work is checked by teachers every Friday and classes can earn an extra 15 minutes of sports time. 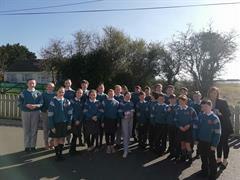 Oibríonn Gaelscoil Ros Eo i gcomhpháirt le cúpla club spóirt sa cheantar. Bíonn ceachtanna GAA ag gach rang le Vinny ó CLG Naomh Maur gach Céadaoin. Roineann Naomh Maur a halla agus páirceanna linn fá choinne ceachtanna chorpoideachais, treanáil agus cluichí peile, treanáil agus cluichí iomaníochta agus ár siúlóid maidin Dé hAoine. Bhí ceachtanna rothaíochta ag Rang a Cúig leis an ‘Bike Doctor’. D’fhoghlaim siad scileanna rothaíochta chomh maith le sábháilteacht bóithre. I dTéarma a Dó téann Rang a 3, 4 agus 5 chuig Alsaa do cheachtanna snámha. Ghlac Rang a 5 agus 6 páirt i Marathon Kids i mbliana. 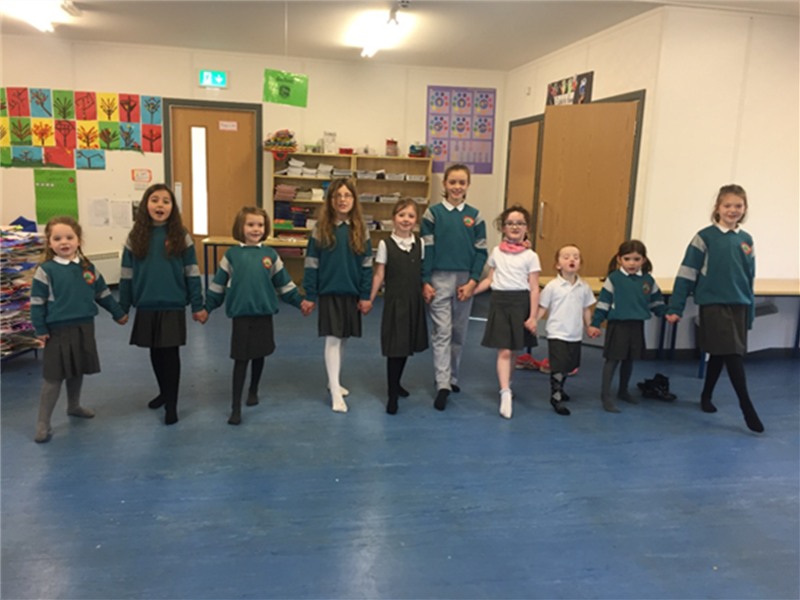 Tá rang iar-scoile i nGaelscoil Ros Eo freisin mar shampla, rince gaelach, spórt agus cluichí agus damhsa. Rinne an coiste gníomhach suirbhé ar na clubanna spóirt ina bhfuil na páistí mar bhaill díobh tar éis am scoile agus tá na torthaí le feiceáil ar an taispeántas san fhoirgneamh nua. Is cosúil go bhfuil scoil gníomhach againn! Is féidir leis na daltaí teastas, bonn etc. ó na clubanna seo a thabhairt isteach le thaispeánt ag an tionól míosúil. Go minic, seoltar abhaile eolas faoi chlarúchán le clubanna sa cheantar. Má tá tú go iarraidh go seolfaidh an scoil eolas amach faoi aon chlub ina bhfuil tusa páirteach, cuir ar an eolas muid. Gaelscoil Ros Eo works with a number of local sports clubs. All classes have GAA lessons with Vinny from St. Maur’s every Wednesday. St. Maur’s also kindly allow us to use their pitches and hall for PE lessons, football and hurling training and games and our walk on Friday morning. 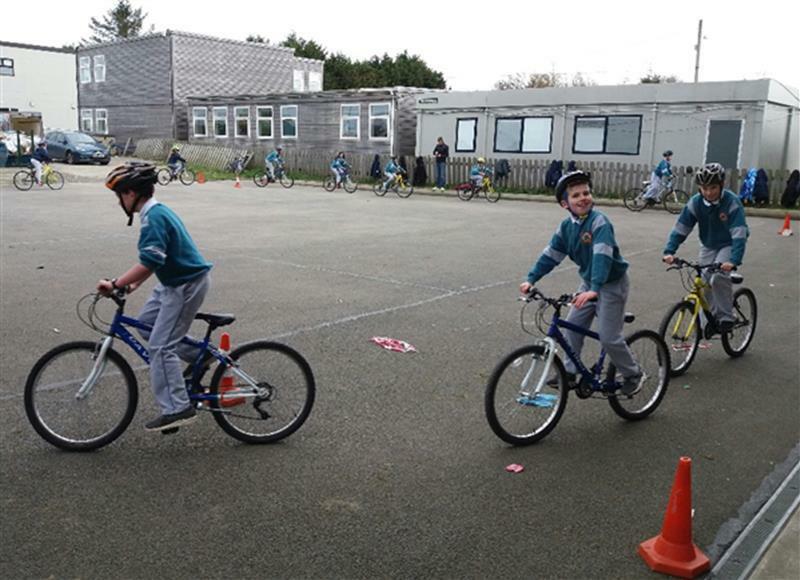 Rang a cúig have had cycling lessons with ‘The Bike Doctor’ where they have learned basic cycling skills as well as road safety when cycling. 3rd, 4th and 5th class go to swimming lessons in Term 2 in Alsaa. Rang a 5 agus 6 took pat in Marathon Kids this year too. Gaelscoil Ros Eo also have a number of after school sports clubs including rince gaelach, spórt agus cluichí agus damhsa. Our coiste gníomhach have carried out a survey of the sports club the pupils attend outside of school as can be seen on our notice board in the new building. It seems that we have very active students! The students are welcome to bring in any prizes, medals, certificates etc. to be shown and discussed at our monthly assembly. 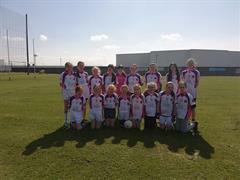 Gaelscoil Ros Eo often send home information about registration for sports clubs in the area. If you are aware or are part of any local sports club please let us know and we can send home information about these clubs as well. 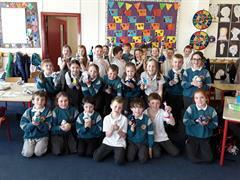 Bhí Seachtain Ghníomhach sa scoil don chéad uair i nGaelscoil Ros Eo in 2017. Rinne an coiste gníomhach suirbhé ar na ranganna le fáil amach cén sort rudaí a bhí na páistí ag iarraidh a dhéanamh don tseachtain seo. Roghnaítear cluichí tag, cluiche corr, damhsa, seachain an liathróid agus siúlóid timpeall na páirce. Bhí Lá Spóirt ar siúl freisin agus bhí cuid mhór bonn le thabhairt amach ag Máistir Tim! 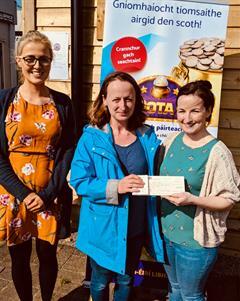 Bhí teastas ann freisin do na daltaí a rinne sar-iarracht taisteal gníomhach a dhéanamh i rith an téarma dheireanaigh. Lean ar aghaidh leis an obair ghníomhach iontach i rith an tsamhraidh! We had our first Active Week in 2017. The coiste gníomhach did a survey of the students to find out what activities they wanted to do as part of their Active Week. The children took part in lots of different activities for example tag games, rounders, dance, dodgeball and a walk around the pitches. We also had Sports Day and Maistir Tim had lots of medals to present to each class! Pupils who made an extra effort with active travel to school i.e. by walking or cycling, were presented with a certificate too. Remember to keep active during the summer!